Place a large pot of salted water for the pasta on the burner on high. While the water is coming to a boil, in a large bowl, toss together shrimp, olive oil, red pepper flakes, salt, and Aleppo pepper flakes, making sure shrimp is completely coated with oil and seasonings. Heat a large skillet on medium-high or until a drop of water sizzles on the surface. There is no need to add additional oil because the shrimp is coated with it. Cook shrimp in a single layer, about 1 to 2 minutes per side or until pink on the outside but still translucent, not opaque, in the middle. It will continue to cook when heated in the sauce. Transfer shrimp to a bowl and set aside. Return the same skillet to the burner over medium-high heat and bring the temperature back up until a drop of water sizzles on the surface. If there isn't enough oil remaining in the skillet after sautéing the shrimp, add 1 more tablespoon of good-quality olive oil. Add onion with a pinch of sea salt and cook until onions are translucent, about 2 to 4 minutes. Add garlic, anchovies and oregano to onion, and cook and stir until aroma from oregano is apparent, about 1 minute. Deglaze the pan by pouring white wine over the onions and garlic and bringing it to a boil while scraping the browned bits of food off the bottom of the pan. Add crushed tomatoes and their juices and lower heat to medium-low. Cook and stir until tomato mixture thickens and flavors blend, 10 to 15 minutes. The pasta water should be boiling at this point. Add the purchased linguine and cook according to package directions. By the time the sauce is ready, the pasta should be cooked. If using fresh pasta, the cooking time will be just a few minutes, so add it to the water when you return the shrimp to the sauce. Drain the pasta but reserve 1/2 cup of the cooking water in case the sauce is too thick. Add the reserved shrimp and accumulated juices to the sauce. Bring to a boil, reduce heat and simmer about 2 to 4 minutes or until shrimp are cooked. If the sauce is too thick, add up to 1/2 cup of the reserved pasta cooking water to loosen it. Stir in chopped parsley. Add black pepper to taste, if desired. 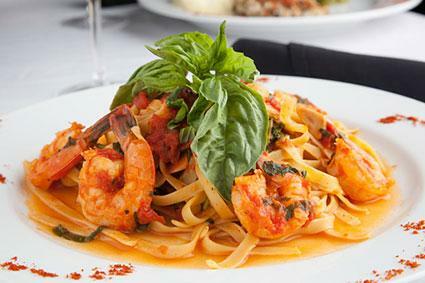 To serve, place cooked, drained and hot linguine on a large serving platter or divide among four dinner plates, then pour the shrimp and sauce over all. Garnish with generous sprigs of fresh basil. Accompany with warm, crusty Italian bread and a side salad, if desired. Lobster or other seafood can be substituted for the shrimp in this recipe. While the current wisdom says there is no right or wrong when it comes to wine pairings, many authorities believe a dish like this deserves a good white, medium-alcohol wine because two of the ingredients are shrimp and chili pepper. Italian food expert Edwin Garrubbo says, shellfish develops a metallic taste when paired with red wines and spicy foods are intensified with higher-alcohol wines. He recommends a Pinot Grigio with 13.5% alcohol by volume or less.